INTIO is committed to developing software tools for planning, image guidance and quantitative image analysis for the interventional oncology market. Whether cancer patients are treated by systemic, local or regional therapies, INTIO has solutions which aid the physician as he plans, treats and assesses the effectiveness of the particular therapy used to treat his patient’s cancer. The INTIO ClearStart•SVM™ Segmentation and Volumetric Measurement (SVM™) system received FDA 510(k) clearance in December 2011 for applications in lung, liver, and lymph node lesions. The ClearStart•SVM™ Segmentation and Volumetric Measurement (SVM™) system uses data from contrast and non-contrast CT examinations of patients presenting with solid tumors. The SVM™ system segments the tumor within the organ and determines measurements such as longest tumor length in axial views as well as tumor volume. Diagnostic CT scans are viewed in both multiplanar reformatted (MPR) views and 3D volume rendered (VR) views, allowing the user to choose the best visualization of selected tumors to be treated. Typically tumors are visualized in a multiphase contrast CT exam using the phase in which the tumor is seen best for analysis. User selected lesions are segmented with minimal user input. The user places a cursor over the tumor and by simple mouse clicks inserts one or more region-growing seed points in the tumor to be segmented.1 Feedback of the seed location is shown in graphical overlays on the MPR views. After the seed or seeds are placed, the user activates a computer determined bounding box surrounding the marked lesion, with the surrounding tissue demonstrating a contrast difference to the marked tumor. The lesion is then segmented using 3D active contour methodology. 1 Adams R and Bishof L, Seeded Region Growing, IEEE Trans PAMI (1994) 16(6): 641-647. TipTRAC™ is a feature of ClearStart SVM™, which gives the physician real-time visual feedback about probe placement relative to the tumor outlines. With TipTRAC™ the interventional radiologist can confirm visually the exact probe placement, in real-time. Using this method, speculation and procedure time are reduced, accuracy is increased, and the risk of having to bring the patient in again for another ablative session is minimized. Whether using multiple needles – as in an IRE or in some microwave procedures – or a single probe in radio frequency ablation, knowing where the tip of the needle is relative to the tumor and critical structures is very important. TipTRAC™ eliminates the need to rely solely on anatomic landmarks when placing ablation probes. Used in CT-guided ablative therapies, TipTRAC™ gives the physician a 3D image showing the position of the ablation needles relative to the outlines of the tumor selected for ablative treatment, whether the needles were positioned by electromagnetic (EM) navigation or by free hand. This “real time” visualization allows the interventional radiologist to determine if needles need to be repositioned or if an additional needle may be required to achieve a compete ablation. This can be determined prior to the device being energized. The INTIO SyncVIEW™ feature provides the interventional oncologist the unique ability to view the segmented target lesion as well as the post treatment ablation zone, intra-procedurally. 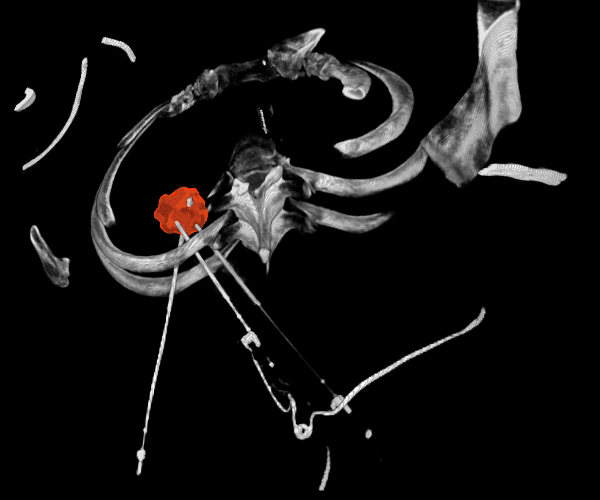 This real-time approach removes guesswork, increases accuracy and reduces procedure time while enhancing confident decision-making in all percutaneous CT guided ablations. What can SyncVIEW™ do for You? The speed and precision of the SVM™ system eliminates the painstaking manual measurements used to segment the tumor and the subsequent ablated zone by automatically computing and delivering a 3D volume of the tumor as well as the ablated zone. SyncVIEW™ enables the visualization of the segmented tumor and the correlated post treatment ablated zone, all in the same 3D view. SyncVIEW™ displays the tumor in red, along with the treatment zone in blue in the same 3D space, which allows expedient and intuitive review by the interventional oncologist as to the effectiveness of the treatment of the tumor. The use of SyncVIEW™ is intuitive and quick, and greatly reduces both intra-operator and inter-operator variability of the measurements producing results that are accurate, reliable, and reproducible – over time and across institutions. SyncVIEW™ is used by interventional oncologists for planning, targeting and immediately confirming the ablation defect relative to the tumor. Shown below is an example of the SyncVIEW™ application with pre-treatment tumor volume (Fig. 1), post-treatment ablated zone (Fig. 2), and the SyncVIEW™ correlated result(Fig. 3), which provides the physician immediate visual confirmation of the treated lesion. The images are displayed in quadrants; each quadrant is active for real-time review of data. The ability to review “in real time” during interventional procedures can potentially enhance patient outcomes. The uniqueness of SyncVIEW™ provides immediate visual confirmation of ablative treatment success and diagnostic confidence to the user. Figure 1: Segmented lesion (pre-treatment) prjected in active axial, coronal, sagittal and 3D views. Figure 2: Segmented ablated zone (post-treatment) projected in active axial, coronal, sagittal and 3D views. Figure 3: SyncVIEW of lesion and ablated zone in active axial, coronal, sagittal and 3D views. The INTIO ClearView™ Oncology Visualization System, which will provide near real-time feedback to physicians performing thermal ablation, is in development to validate the ability to accurately represent temperature distributions using image-based surrogates of temperature. Preliminary work in this area has supported the filing and issuance of patents in this field providing INTIO with a strong intellectual property position. This system will provide all the same benefits as the ClearStart•SVM™ system, with the added features to enhance the interventional oncologist’s ability to monitor solid tumors during thermal or other intra-operative therapy treatment, adding enhanced post-treatment assessment of the effectiveness of the loco-regional therapy. More information about the ClearView™ Oncology Visualization System will be available soon.